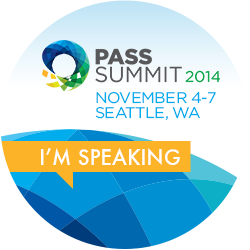 I’m pleased and honored to say that I will be speaking at PASS Summit 2014 November 4 – 7 in Seattle. I will be presenting one general session and one lightning session. I’m excited to be an attendee and a speaker at the world’s largest gathering of SQL Server and BI professionals. I hope you can attend my sessions, described below. You have geospatial data and you know that plotting it on a map will help deliver insights. Or maybe you just keep hearing “geospatial” as one of the current BI buzzwords and you want to be informed about your options when you get to it. The Microsoft BI stack provides several options for visualizing location data. But, how do you know which tool will best serve your purpose, or what factors are even important in making this decision? In this session, we’ll identify factors to consider when deciding which tool to use to visualize your data in maps such as system/software requirements, internet connectivity requirements, availability and type of location data, required level of technical understanding, and more. We’ll also explore the requirements and features of maps in Power Map, Power View, Reporting Services, and the Bing Maps add-in for Excel. You’ll leave this session knowing your options for creating maps and confident in your ability to choose the best path/tool within Excel and SQL Server. As a data professional, there is a good chance that you will have to visually represent data for coworkers, clients, or even just yourself. Understanding how our eyes and brains interpret visual information can help you present data in a way that is both effective in communicating your message and visually appealing. In this session, we’ll look at some neuropsychology concepts and data visualization best practices, then discuss some simple ways to employ them to help you professionally communicate a message with data. Whether you present database performance information, financial forecasts, or marketing campaign results, these tips will help you minimize distractions and impress busy colleagues with your data communication skills. If you haven’t registered for PASS Summit yet, there’s still time. The cost of the full conference is $1895 if you register by September 26. Use the KC Server Server User Group discount code USNCS25 to get $150 off of registration and support our local user group. There is also a discount code for the PASS Business Analytics Virtual Chapter for $150 off: VCSUM04. I hope to see you there!